It’s 7:45 on a Sunday morning and I’m already in the kitchen making soup. It seems to be the place that I have been gravitating to this past month at all times of the day and night. 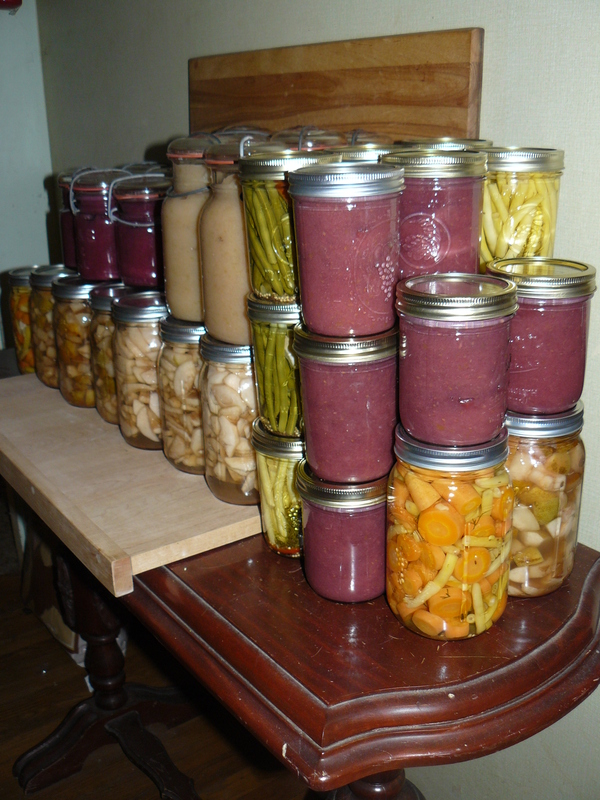 Over the past three weekends I have canned 10 quarts of spiced apple slices, 11 quarts of apple sauce, 7 quarts of apple pear compote, 7 pints each of raspberry and blueberry applesauce, 14 pints of dilly beans, and 4 quarts of pickled carrots & beans. In the Harsch fermenting pot is a batch of ginger carrots. I have stocked up on grains and many kinds of organically grown dried beans. There is a large basket of acorn & butternut squash growing in the garage that I add to each week from the farmer’s market, where I can buy a whole squash for just a dollar right now! And I still have about a bushels worth of apples left from the harvesting of my one prolific tree, even after all the various forms of canned apple products made. 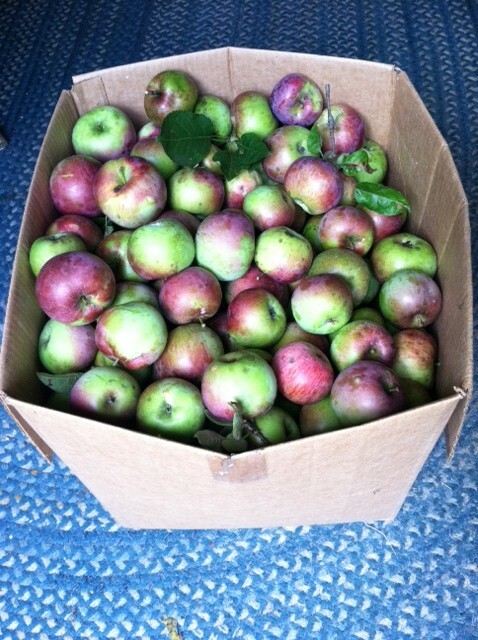 It is truly amazing how many apples this one little tree has yielded. It seems to be a common story right now. Trees across the valley that typically haven’t had fruit in years are now burgeoning. And those that didn’t bear fruit last year (because of the freak spring storm that wiped out blossoms) are offering twice as much as usual. The abundance is overwhelming. The kitchen continues to call, and I keep responding. My whirlwind summer romance didn’t end so well. Being in the kitchen and moving to the rhythm of what wants to be expressed there is balm on my wounds. I have made the choice to stop resisting being ‘here’ in the heart of my home and have settled back in. The truth is, I love being here. I love the energy of us four women currently sharing the house, me, my daughter Molly, Brazilian graduate student Cristiane, and Spanish graduate student Almudena (and her sister Mari who was also with us for three weeks). I love that we are already sharing meals and traditions with each other. I love the feeling of preserving these batches of freshness and sunshine and locally grown nourishment in preparation for the time during the winter when such freshness is not so abundant. I love setting the big canning pot on the stove full of water to boil while deciding which of the dozens of jars I will wash, considering what I will fill those jars with, knowing that each batch will be something unique and never to be replicated exactly the same way again. The rhythmic repetitiveness of peeling and chopping apples, cleaning greens beans, and grating carrots is meditative and calming. The vigorous working of the food mill is a full body exercise, tadasana in motion with feet firmly grounded while the entire upper body sways to the swirling motion of the mill blade squeezing out the gorgeous steaming applesauce. There is somethig cathartic about taking all the remains out to the compost, washing out each pot as I finish, putting everything away and restoring the kitchen to order, ready for the next person. As much as anything else I call a spiritual practice, everything in this process of canning is a function of where I am in my awareness, both in my body, in my heart, and in the space of this kitchen I have come to love. Each round is an adventure. And when the processed jars are lined up on the table to cool, I feel the accomplishment of truly being in the right place at the right time for making these offerings. The balm of this work is a reminder that I can always make the choice to see it this way. It’s a cool foggy morning this day before the last day of September. I am choosing to take this day to rest. 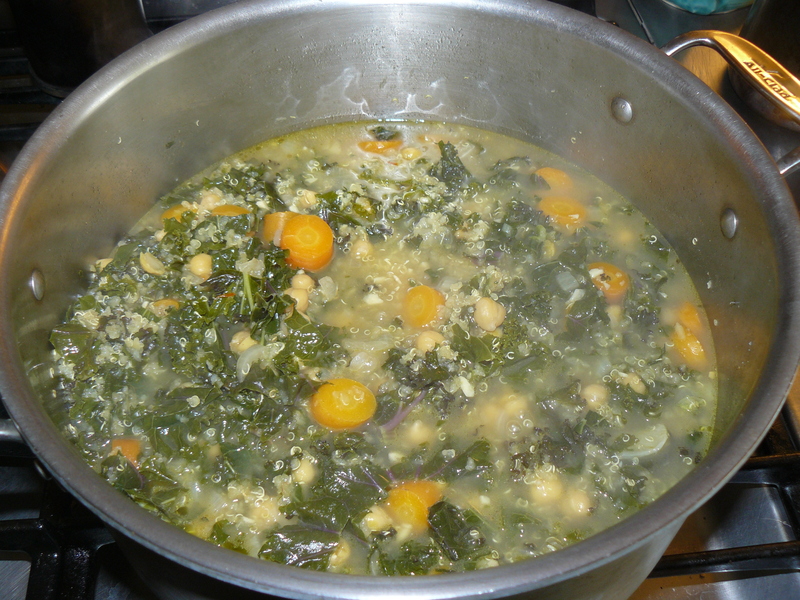 I’ve decided to make a warming spicy chickpea (garbanzo bean) and kale soup. 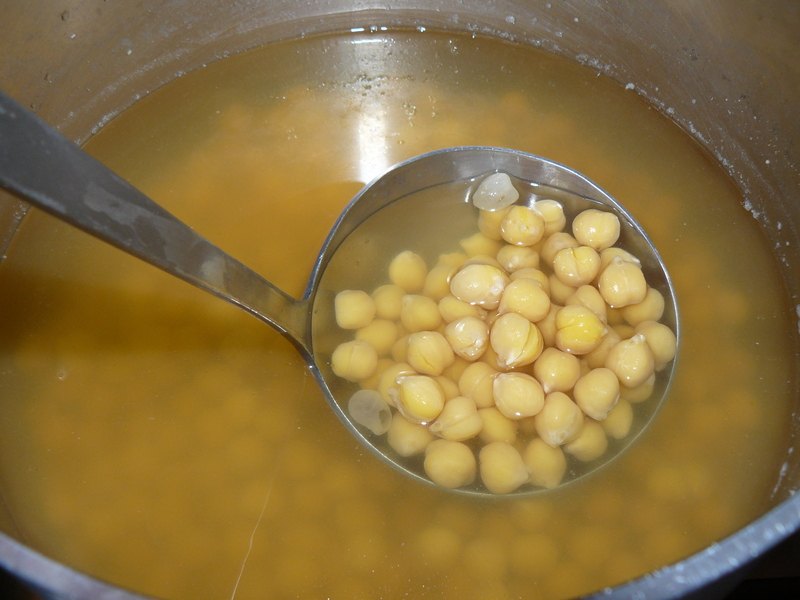 I soaked two cups of dried garbanzo beans overnight and cooked them when I first got up. I’ve learned that they don’t take long at all and it is easy to overcook them. There is nothing like the firm soft bite of a perfectly cooked garbanzo and that’s what I aim for this morning. After draining them, cover with fresh water and bring to a boil. When the white foam is swirling in the center, I skim it off, turn the fire down to low and simmer with a lid partially off to let some steam out. Check them frequently. This batch was done after about 15 minutes this morning. You just have to keep testing them though, the goal is to turn the heat off before they get too mushy or the skins start coming off. Add some sea salt to the pot and let them cool in their liquid. The soup is an easy combination of fresh onions, carrots, garlic, ginger and kale, all found at yesterday’s farmer’s market. One large chopped onion, 4-5 medium diced carrots, 4 large cloves of chopped garlic, and about 2 tablespoons worth of the most gorgeous fresh chopped ginger that is also grown locally. Saute the onions and carrots in some olive oil in a soup pot for about 5 minutes. Add the garlic and ginger and stir for another minute. Add 2 teaspoons cumin, an equal pinch of cayenne and allspice, a cinnamon stick, 2 bay leaves, and a generous pinch of saffron, crushed. Stir another minute. Add 3 cups of the cooked chickpeas and stir again to cover with spices. Add 8 cups of fresh vegetable broth or 8 cups of water and 4 vegetable bouillon cubes (my current favorite is by Rapunzel, a vegan variety w/ sea salt), 1/2 cup rinsed quinoa, and bring to boil. Lower fire and simmer for 20 minutes. Remove spines and chop 1 bunch of kale. Add to soup w/ more water to just cover and cook another 10 minutes. Turn off fire, add salt to taste, and let soup sit. 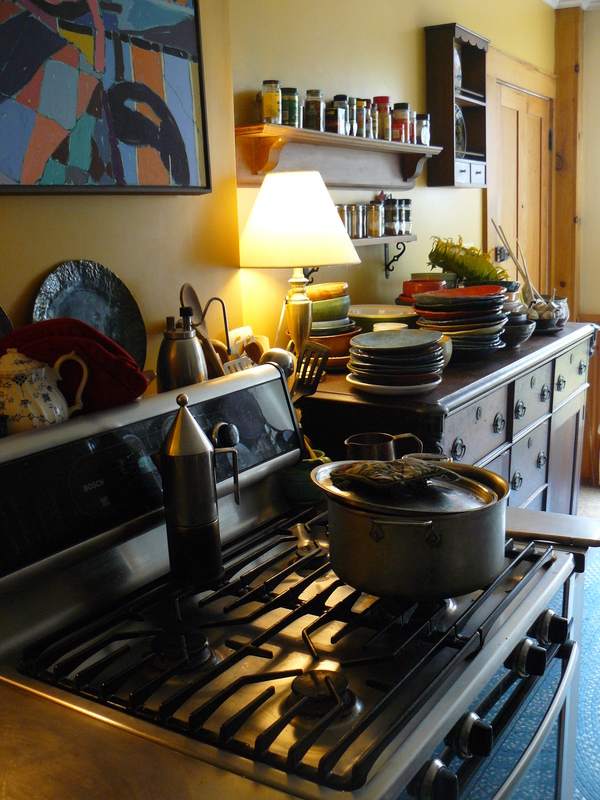 So happy to see another post from your bounteous kitchen. I’m treasuring my token of last Sunday, similarly spent. Entering into the Spirit of the Harvest is so satisfying, nourishing and healing. Thank you for sharing. PS What’s with the ad at the end of your post?? ?